Yup, that’s me. At four or five, wearing my favfavfavorite outfit of all time. I don’t think I took this off for a year – even in the summer! I thought it was awesome and I loved wearing these clothes. At once ALL TOGETHER. 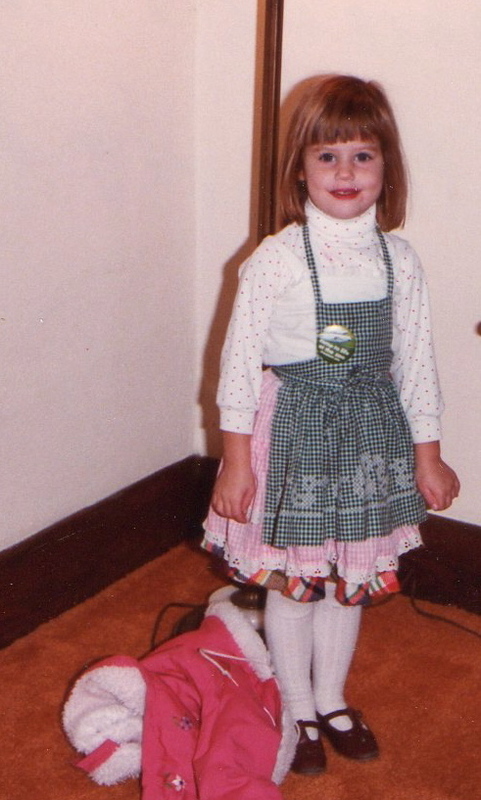 Growing up my parents always let me pick out my own outfit and do my own hair. Even if my outfit was crazy or my hair looked, well, like a five year old did it, it was so worth it. I was allowed to make those decisions for myself, at an early age, and it instilled in me a sense of independence and confidence. Maybe it’s why I have always been able to stand up for myself when my opinion is not the popular one, or take a trip to San Francisco by myself, or go to dinner by myself at a fancy restaurant, or quit a job with no other job in place, or stand up for what I believe in. Thank you Mom and Dad, for always letting me be – ME. Posted at 11:38 am in Daily.